"The world's simplest dessert! Strawberries dipped in chocolate." 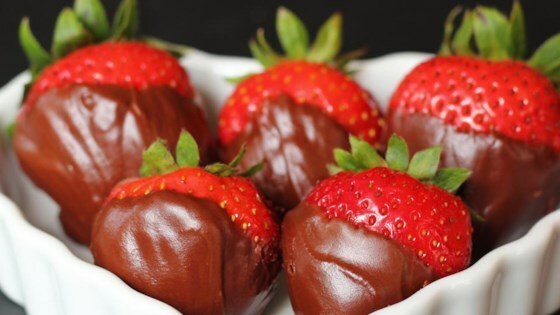 See how to make luscious chocolate-covered strawberries. I found the chocolate a bit hard to deal with at first so I added vegetable shortening and melted again. This worked out a lot better for me, otherwise this is wonderful and fun. I USED SEMISWEET CHOCOLATE (CHOCOLATE CHIPS) AND THIS RECIPE CAME OUT GREAT! IT CAN'T GET ANY EASIER AND EVERYONE RAVED ABOOUT THEM!